Qatar Airways has been in the news in recent years. You may have heard about them joining the oneworld alliance and completely revamping Qatar Privilege Club, its frequent flyer program. Or more recently you might have heard the name because of the ongoing saga over the delivery of its long-awaited Airbus A380s, the biggest, most comfortable planes in the sky. Now that the planes and oneworld partner awards are both in place, Qatar Airways is working hard to position itself as the go-to airline for travelers looking for that over-the-top Middle Eastern luxury, paired with its strong international connections and a global reach. Like many Middle Eastern carriers, the fact that Qatar Airways had a small fleet serving a few destinations and only a handful of award partners, each with their own complex award chart, hampered their entry into the Western market. Qatar Airways’ leadership anticipated these issues many years back and has been working to create an airline and award program to bridge the type of airline services expected in the Middle East with those that flyers are accustomed to in the West. Though the award prices went up on several routes when Qatar joined the oneworld alliance, its prices are still very reasonable, particularly considering that they do not charge fuel surcharges. With a commitment to high-quality service, membership in a major alliance and very reasonable award redemptions, Qatar is an easy choice for North American flyers looking to check out the luxurious experience of a Middle Eastern airline. 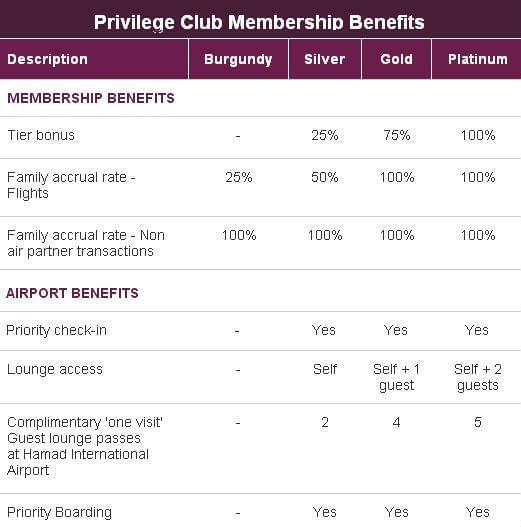 How Can You Use Qatar Airways Privilege Club Qmiles? Like many Middle Eastern carriers, Qatar Airways does not have an award chart as we typically think of it. It offers a mileage calculator instead, so passengers don’t have to muck through a huge list of awards. In general, this can be slightly irritating, but Qatar’s mileage calculator is one of the best. It allows you to see how many miles you would earn if you paid for the flight, along with the number of miles required to buy an award, upgrade a cash ticket, or pay your excess baggage fees with miles. Partner flights conform to a standard distance-based award chart, which is available online. 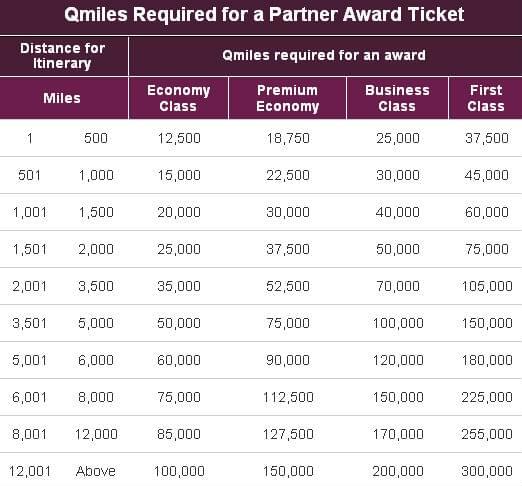 The table below shows the amount of Qmiles required for Qatar Airways partners award tickets according to the distance and class. In addition to standard flight and upgrade awards, Qatar Airways frequent flyer members have several other options for using Qatar Airways miles for flights. With Qmiles plus Cash fares, you must pay a minimum of half the miles required for your award ticket with miles, and pay the reminder in cash. The Easy Deals option knocks up to 50 percent off the standard rate on select routes published every two months. Flexi awards gives you access to any seat on an in-demand flight for twice the miles typically required, which is better than many airlines that charge three to four times the lowest rate for this privilege. You also have the option to upgrade flights and pay for excess baggage with miles at the airport at 24 destinations worldwide (including London, Miami, Philadelphia and Washington). Qatar Airways’ new A380s may not have a three bedroom apartment like Etihads Residence, but they are still pushing the limits of how refined a first class cabin can be in terms of appearance, service and amenities such as 10-course meals. You can find Qatar Airlines review of A380 flight experience on their official website. Though its not the longest route Qatar uses this aircraft for, the London-Doha route is both the most convenient and offers the best value for your miles, around 5.4 cents per mile. You can also read Qatar Airways review of business class in comparison with Emirates. Qmiles plus Cash fares seem like a great way to get an award when your balance is low, but the amount you pay in cash is equivalent to about 3 cents a mile a pretty poor rate for purchasing miles. Its best to avoid this unless you are getting a really expensive ticket, such as first class on a long-haul route. Being an elite Privilege Club member means you get elite benefits on other oneworld flights. There are three elite levels: Silver, Gold and Platinum. Qatar Airways status members automatically receive Qcredits: 40 for Gold members and 60 for Platinum members that can be used for both single cabin upgrades (economy to business, or business to first) and two cabin upgrades (economy directly to first), as well as lounge access and award fees. If you do not have Qcredits, you can upgrade using miles. The rates are rather high compared to other airlines, but you do have the option to upgrade from economy directly to first. If you buy a discounted economy ticket, though, youll end up paying nearly the same amount of miles to upgrade as you would to buy a first class ticket in the first place. For example, it costs 100,000 Qatar frequent flyer miles to upgrade to first on a flight from New York to Doha, versus 105,000 miles for a first class award. Qatar Airways credit card is not issued in the U.S., though Qatar airlines partners with American Express and HSBC abroad.